You may have heard – at this year’s gamescom in Cologne, we announced eight new Xbox One bundles. In case that wasn’t enough, we also revealed three new Xbox Wireless Controller options, too. Whether you’re after the stunning Xbox One X Gold Rush Special Edition Battlefield V bundle, a new Desert Camo personalized Xbox Wireless Controller from Xbox Design Lab or Forza or Tomb Raider bundles, we’ve got something for everyone to help you choose your favorite way to play with your friends on Xbox. UPDATE: This post was updated on 10/8 at 7:00 a.m. PT to reflect an updated launch date for the Xbox One Battlefield V bundle, and additional content that will be included with every Xbox One Battlefield V bundle. Survive the ultimate life and death fight with the Xbox Wireless Controller – PlayerUnknown’s Battlegrounds Limited Edition, featuring a distressed black digital camo pattern and unique design elements inspired by the game. Be the last one standing with the new and exclusive trigger grip to help you stay on target in the final circle. The controller is bundled with exclusive cosmetic DLC inspired by the controller design. Pre-order today at Microsoft Store and select retailers worldwide. Limited supplies only, shipping on October 30, 2018 for $69.99. Last year at gamescom, we started shipping Xbox Design Lab controllers to more than 20 European countries. This year you can personalize your very own Xbox Wireless Controller in even more, unique ways with new Xbox Design Lab Camo and Shadow options, including five new camo colors and five new shadow colors. In addition, a Sterling Silver Shadow design is available to order for a limited time, now through September 30. 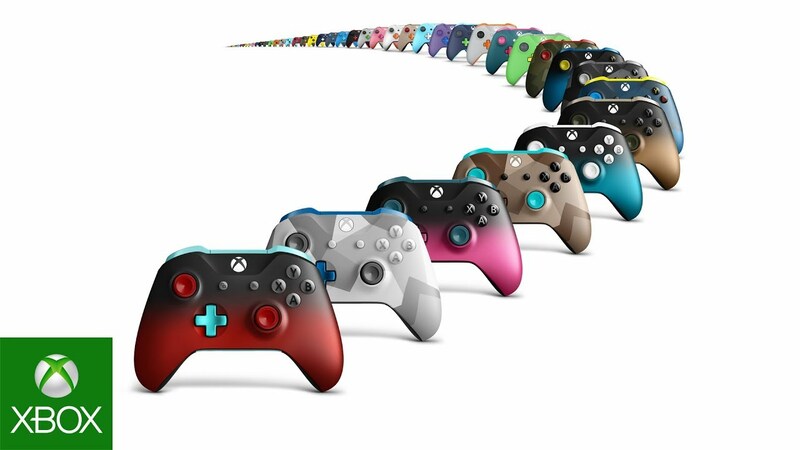 Start from scratch or customize an existing design online, choosing from a wide range of new designs and colors for your Xbox Design Lab controller. There are over a billion ways to design yours at xbox.com/xboxdesignlab. Available now at Xbox Design Lab starting at $69.99. Pre-order the 1TB Xbox One S ($299.99) or 1TB Xbox One X ($499.99) Shadow of the Tomb Raider Bundle and become Lara Croft in a race to save the world from the Maya apocalypse. Master the deadly jungle, overcome terrifying tombs, and persevere through Lara Croft’s darkest hour. On Xbox One X, experience incredible visuals with support for native 4K resolution and HDR. Each bundle comes packed with an Xbox Wireless Controller, a digital download of Shadow of the Tomb Raider, 1 month of Xbox Game Pass and 14 days of Xbox Live Gold. Pre-order now; arrives in stores starting September 14, 2018. Check your local retailer for availability. Pre-Order the 1TB Xbox One S ($299.99) or 1TB Xbox One X ($499.99) Forza Horizon 4 Bundle and experience a shared open world where dynamic seasons change everything. Explore Britain, collect 450 cars or choose to join team multiplayer just for fun to take on the best in the world. The Xbox One X Forza Horizon 4 Bundle brings support for native 4K resolution and HDR, and comes with a downloadable copy of Forza Motorsport 7, too. Each bundle comes packed with an Xbox Wireless Controller, a digital download of Forza Horizon 4, 1 month of Xbox Game Pass and 14 days of Xbox Live Gold. Pre-order now; arrives in stores starting October 2, 2018. Pre-order the Xbox One X Gold Rush Special Edition Battlefield V Bundle and enter mankind’s greatest conflict with Battlefield V as the series goes back to its roots in a never-before-seen portrayal of World War 2. Join the ranks with full-game downloads of the Battlefield V Deluxe Edition, Battlefield 1 Revolution and the classic Battlefield 1943. Enhanced for Xbox One X and supporting 4K resolution and HDR graphics, the Battlefield V Deluxe Edition includes paratrooper apparel, Special Assignments to test your skill, and weekly items coming with Airlift. This special edition Xbox One X features a unique dark gray to gold design and includes 4K Ultra HD Blu-ray, 4K Video Streaming, Spatial Audio and a matching wireless controller. (Battlefield 1943 playable online only.) It also comes with 1 month of EA Access, 1 month of Xbox Game Pass and 14 days of Xbox Live Gold. Pre-order now; arrives in stores starting November 9, 2018 for $499.99, only while supplies last. If you’re looking for more Battlefield V bundles, we’ve got you covered. Pre-order the 1TB Xbox One S ($299.99) or 1TB Xbox One X ($499.99) Battlefield V Bundle and enjoy a digital download of Battlefield V: Deluxe Edition, which also comes with the paratrooper apparel, Special Assignments and weekly items via Airlift. You’ll also get a digital download of Battlefield 1 Revolution and Battlefield 1943 (Battlefield 1943 playable online only). Whether you’re rallying your troops, watching 4K movies, or streaming gameplay, there’s never been a better time to game with Xbox One. Each bundle comes packed with an Xbox Wireless Controller, a digital download of Battlefield V Deluxe Edition, Battlefield 1 Revolution and Battlefield 1943, 1 month of EA Access, 1 month of Xbox Game Pass and 14 days of Xbox Live Gold. Pre-order now; arrives in stores starting November 9, 2018. Pre-order the Xbox One X Fallout 76 Bundle and experience the largest, most dynamic world ever created in the legendary Fallout universe. With support for 4K resolution and HDR, Bethesda Game Studios, the award-winning creators of Skyrim and Fallout 4 welcome you to Fallout 76, the online prequel where every surviving human is a real person. Twenty-five years after the bombs fall, you and your fellow Vault Dwellers – chosen from the nation’s best and brightest – emerge into post-nuclear America. Play solo or join together as you explore, quest, and build your way to triumph against the wasteland’s greatest threats. The bundle comes packed with an Xbox Wireless Controller, a digital download of Fallout 76, 1 month of Xbox Game Pass and 1 month of Xbox Live Gold. Pre-order now; arrives in stores starting November 14, 2018. That’s a wrap-up of all the new bundles and accessories that were just announced at gamescom 2018 during Inside Xbox. Whether you’re an adventure lover striving to become Lara Croft in Shadow of the Tomb Raider, a Battlefield fanatic, looking to join the ranks of Vault-dwellers in Fallout 76 or a controller collector looking for that Xbox Wireless Controller – PlayerUnknown’s Battlegrounds Limited Edition, Xbox has got something for everyone. Games play best on Xbox One, so jump in and join the Xbox family! For more information, visit xbox.com.